Għaqda Drammatika Għajnsielem was established in 1987 with the principal aim of producing quality productions and activities mainly connected with the Holy Week. Due to bad weather our activity Il-Passjoni:Ilbierah u Llum had to be postponed. However Ghaqda Drammatika Għajnsielem would like to inform that the play The Passion: Then and Now will be held on Friday 30th March (Holy Friday) at 11:00am at Fort Chambray. This will take place after concluding The Last Supper that the group will organise at Bethlehem f’Għajnsielem site. In collaboration with the Għajnsielem Local Council and Fort Chambray Limited, Għaqda Drammatika Għajnsielem will be presenting a performance entitled “The Passion: Then and Now”. The Passion event in this short narration will be compared with the tragedies we are living today. Loneliness, distress, illness, bullying, sorrow, abuse, the killing of innocent victims are all experiences that Jesus endured and He is still suffering today through him and her, through you and me. The scriptwriter JoAnne Debrincat is responsible for directing a cast of around 40 actors who will take part whilst Franco Ciangura is responsible for the artistic direction. Various people are also involved behind the scenes. 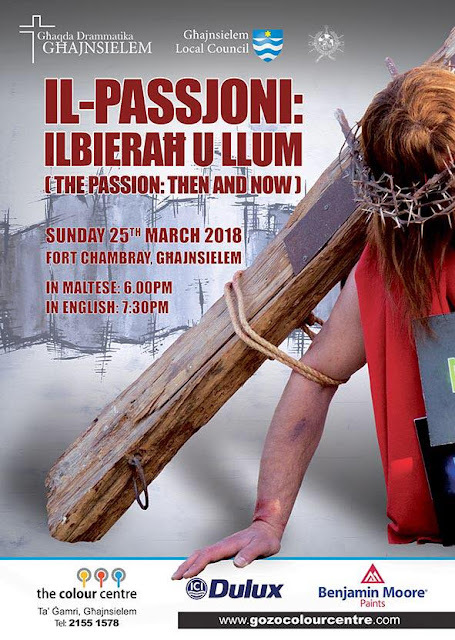 This dramatized version of the passion of the Christ will be held on Sunday 25th March 2018 at Fort Chambray in Għajnsielem at 6pm with a repeat performance in the English language at 7.30pm. Entrance is free. Għaqda Drammatika Għajnsielem is also organizing a live reenactment of The Lord’s Supper where actors will portray Jesus sharing his final meal with his Apostles before his crucifixion. This activity will take place at Ta' Passi fields where the atmosphere and the natural surroundings including the animals, will take visitors back in time to experience The Last Supper. There will also be a live kitchen where traditional Passover food will be prepared. This activity will be held on Holy (Maundy) Thursday evening, 29th March 2018, from 8.30pm until 11.30pm and the following morning, Good Friday, 30th March 2018, from 9am until 12pm. Another activity that Għaqda Drammatika Għajnsielem organizes every year is the procession of Our Lady of Sorrows where around 100 personages dressed as biblical characters take part. The procession will leave the Għajnsielem Parish church at 6.00pm on 23rd March 2018 and will continue throughout the various streets of the village.